The benchmark for midsize SUVs. To learn about special offers on this vehicle. The muscular body of the GLC is wind-tunnel-honed and track-toned. A long wheelbase, big wheels and wide track add up to space, stability and sportiness. Crisp proportions and chrome details attract admiring eyes like it’s drawn to the road. Space, style and substance: The standards of the GLC. Go ahead, touch the materials, stitching and flowing shapes. Feel the precision in its controls and aircraft-style vents. Venture through wide rear doors to the 40/20/40-split rear seats. Even your luggage rides in luxury, with an available hands-free tailgate. Fashion that functions: The richly equipped cabin. There’s something for everyone in the GLC. Heated power front seats include memory and lumbar adjusters. And options range from heated rear seats to rear-door sunshades, a giant panoramic sunroof and handcrafted designo Nappa leather. Always in good shape: Two styling packages. A muscular shape is just the start of a GLC. The Sport Package pumps up its style with 19-inch AMG wheels, chiseled bodywork and a sporty chassis. The Night Package cloaks all that in gloss black accents. And both offer 20-inch wheel upgrades. The turbo GLC 300 4MATIC and first-ever plug-in hybrid GLC 350e 4MATIC are both energetic and energy-conscious. They embrace the road and your passion for driving with composed comfort and a feeling of confident control. And they reassert the “sport” in SUV. Adapts to roads. Ready for loads. With racing-bred design, the 4-wheel multilink suspension clings to curves yet glides over bumps. Clever selective damping allows the shock absorbers to firm up instantly in hard corners while keeping the ride silky on straightaways. Pours on the power and torque. With 241 hp and a 9-speed, a turbo GLC 300 4MATIC can rush to 100 in 6.4 seconds. Its Direct Injection and multispark ignition can self-tune in milliseconds. The GLC 350e teams turbo and plug-in power for 315. 4MATIC: All-wheel drive. For all kinds of drivers. 4MATIC continually sends the engine’s torque to the wheels that can put it to the best use. On slippery roads, it elevates driving confidence. It’s lightweight, nimble and fuel-efficient, to enhance handling and fun year-round. Nine speeds and five modes. The GLC 300 4MATIC’s 9G-TRONIC automatic is smooth, sporty and smart. DYNAMIC SELECT lets you dial in the GLC’s driving character, from enthusiastic Sport mode to easygoing ECO. There’s even a mode you can set up as you like. Sensuous shapes and features ranging from crisp displays to available voice control delight all your senses. Advanced safety systems and driver assists use radar, cameras and more to help make any journey more comfortable, and more comforting. Intuitive innovation. In tune with your nature. Clarity comes from its vivid screen to its available Burmester® audio, touchpad COMAND navigation and Head-Up Display. Intuitive controls, hands-free Bluetooth® and easy-to-personalize settings make technology feel like second nature. Advanced assists. For smoother sailing. A high-tech suite of systems is available to help make every move easier. Some can make traffic less stressful, from cruising to changing lanes. Others can help you find a parking space, then find your way in hands-free. A hybrid with an edge. And a plug for your future. The GLC 350e 4MATIC is the only plug-in hybrid that’s also a GLC. So it not only outperform, it also out-innovates: Radar helps it recoup energy as you brake. GPS map data can better its highway efficiency and in-town range, even when you’re not navigating. Its gas pedal can even help you drive smarter, sometimes using no gas at all. Stated rates of acceleration are estimated based upon manufacturer’s track results and may vary depending on model, environmental and road surface conditions, driving style, elevation and vehicle load. Highway estimate is with a fully charged battery. Compare the estimated Le/100 km to the estimated Le/100 km of other vehicles. You may get different fuel consumption depending on how fast you drive, weather conditions and trip length. Bluetooth interface does not provide phone charging or external antenna. Voice interactivity feature is dependent on selected handset. Phone sold separately. Bluetooth is a registered trademark of Bluetooth SIG, Inc. Active Brake Assist may not be sufficient to avoid an accident. It does not react to certain stationary objects, nor recognize or predict the curvature and/or lane layout of the road or every movement of vehicles ahead. It is the driver’s responsibility at all times to be attentive to traffic and road conditions, and to provide the steering, braking and other driving inputs necessary to retain control of the vehicle. Drivers are cautioned not to wait for the system’s alerts before braking, as that may not afford sufficient time and distance to brake safely. See Operator’s Manual for system’s operating speeds and additional information and warnings. Even the most advanced safety systems may not be sufficient to avoid an accident. It is the driver’s responsibility at all times to be attentive to traffic and road conditions, and to provide the steering, braking and other driving inputs necessary to retain control of the vehicle. Drivers are cautioned not to wait for system alerts before braking or taking evasive action, as that may not afford sufficient time and distance. See Operator’s Manual for system’s operating speeds and additional information and warnings. Some features are optional, or further enhanced by other options. While the navigation system provides directional assistance, the driver must remain focused on safe driving behaviour, including paying attention to traffic and street signs. The driver should utilize the system’s audio cues while driving and should only consult the map or visual displays once the vehicle has been stopped in a safe place. Maps do not cover all areas or all routes within an area. 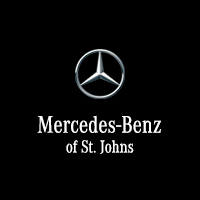 Mercedes-Benz St. John's	47.5530196, -52.7714077.